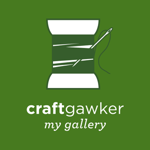 I'd been hearing a lot about NatureBox around the blogosphere and decided to give it a try. It's a subscription based box-a-month all natural snack company and I signed up back in March because I figured it would be perfect for us to always have new snacks on hand with the baby around. 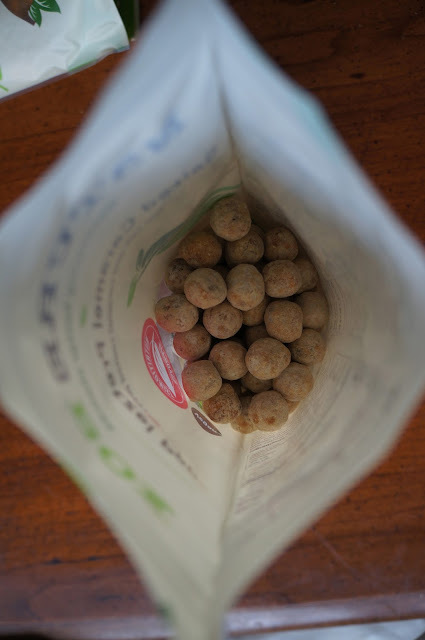 Every NatureBox has 5 snacks a month. Usually there's some sort of cnacker, a fruit or veggie based snack, something sweet, and almost always some granola. 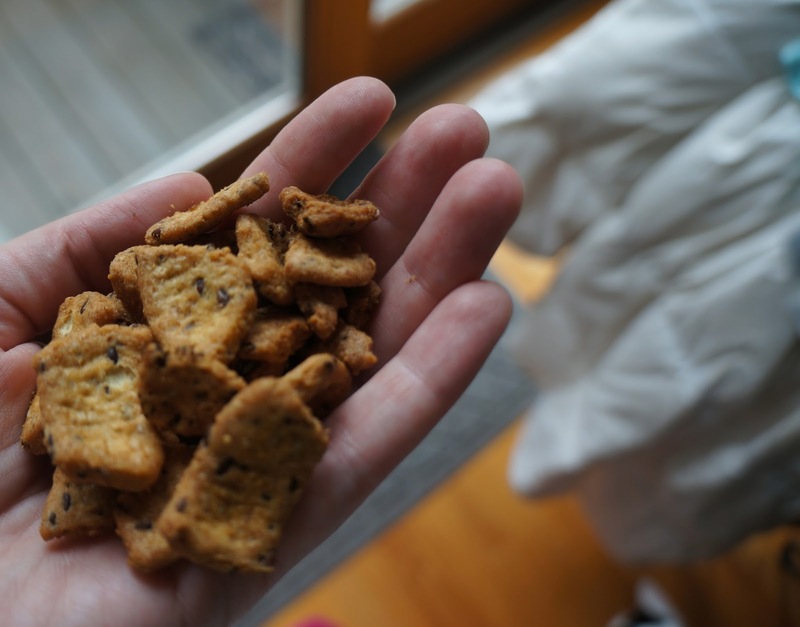 I LOVED this month's chia seed crackers which were crunchy and almost buttery tasting (despite being vegan). 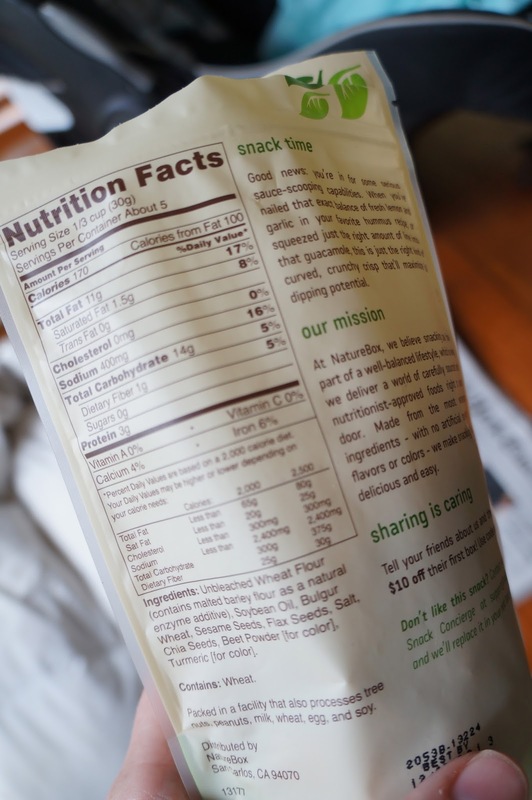 The back of the packages include nutrition facts, obviously (no wonder these tasted so good) and an idea on how to use the snacks (in this case, with hummus or guac). Here's where the "I want to love NatureBox" comes in. In each box, there's usually a snack I love and then a few that I don't. NatureBox has been stating in the "My Account" section for months that I'll have the chance to personalize my box soon. I check in on this often and I'm still not able to choose my own snacks. I'm not ready to cancel yet since, like I said, I do usually like some of the snacks. But unfortunately, I find some really bland. These "salted caramel pretzel pops" below sound like something that I would LOVE but I found them dry and tasteless. Definitely not worth the calories or the subscription price. I do love the frequent granola, though. Jesse & I eat a lot of granola with greek yogurt and it's nice to have new flavors monthly to try out. 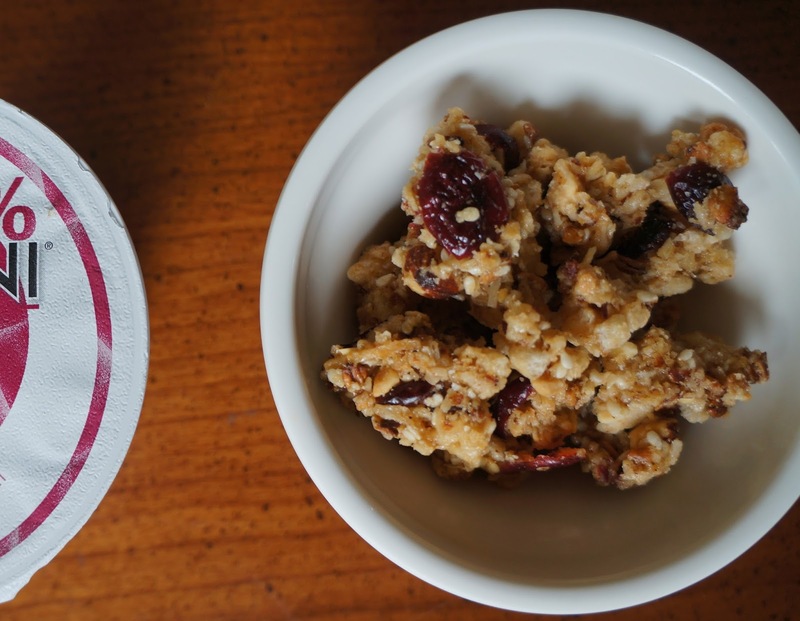 This month's "cranberry macaroon granola" was perfect with fruity Chobani flavors and tasty enough to snack on solo. So the jury is still out for me & NatureBox. I'm waiting for them to let me customize some of my own snacks. While I like the surprise of opening up the box each month, I'd like to make sure a few of my preferred items are in there along with the wildcards. If you're interested in trying NatureBox, you can get 50% off of your first order here. Let me know what you think and stay hungry! Caitlin, I was having the same issue, but then I read somewhere on the Naturebox website that you have to email them to have them add the option for you to select your own snacks. It's still in testing, but they responded to me right away and I've had no problem choosing and receiving the specific snacks I want. Good to know! They reached out to me and I'm set up on my custom snacks... Cherry Berry Mix here I come!